FTL: Faster Than Light (was the subtitle really necessary?) is the first tangible return on my numerous Kickstarter investments, and it’s a very promising trailblazer for the concept of crowdsourced games in general. 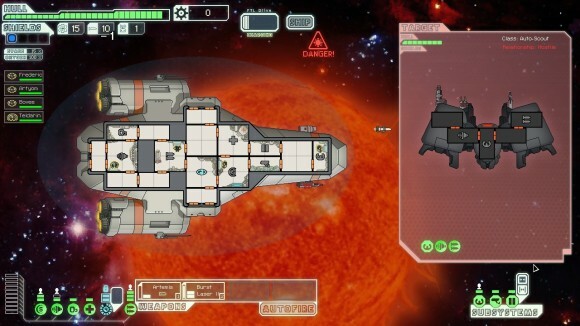 The best way to describe FTL is as a sort of limited space-based roguelike. This is probably doing it something of a disservice since it does an awful lot of things that I have either never seen before period, or else last saw in obscure Acorn/Atari/Amiga games twenty-odd years ago, but it’s the closest I can get to summing the game up in one sentence. You start the game with a ship, some guns and a few crewmen, and your task is to make your way across a collection of randomly generated sectors towards the one where the big boss lives so that you can defeat him in single combat. That’s pretty roguelike-y, even if the mechanics of ship-to-ship combat in FTL are drastically different from hitting a goblin with a club. Each sector is made up of a collection of jump beacons placed next to points of interest. You can travel to any jump beacon in range, and each jump you make uses up one fuel. What you find at your destination could be just about anything from a friendly store to a space station that’s on fire to a pirate attack. Some of these random encounters are good, giving you lump sums of scrap (the game’s currency), missiles and fuel. Some require you to make a choice which could involve fighting another ship; choosing correctly can lead to big rewards like extra weapons systems and crew members (you can never have enough crew members). And some just throw you into combat straight away, at which point you have two options: either destroy the attacking ship, or else hold them off long enough for you to charge your jump engines and escape. 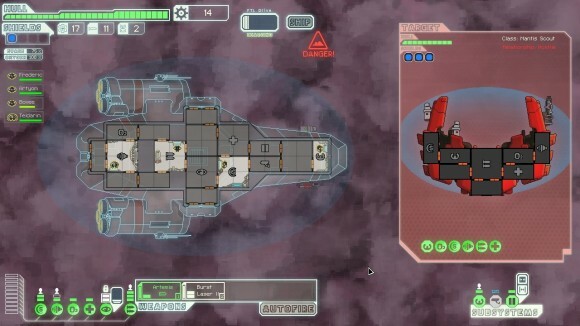 Ship combat is what you spend most of your time in FTL doing, and it’s by far the most comprehensive part of the game. Ships are divided into critical systems and subsystems such as shields, weapons, engines and so on, each of which is located in a specific room in the ship that can be targeted by both you and the enemy. Each system requires power from the main reactor to run and the chances are you’ll only have so much to go around, and so you might temporarily turn off the power to your medbay and your engines in favour of boosting the shields. The most crucial systems can be manned by crew members, increasing their efficiency so that weapons reload faster and shields recharge quicker. You can have anywhere between one to four layers of shields protecting your ship (although four layers of shields are monstrously power-hungry), and each shield layer will absorb one laser blast and block one point of damage from a beam weapon before needing to recharge. Often the recharge time of an enemy’s shields is faster than the reload time of your weapons, so combat mainly hinges around the following conundrum: how do you keep their shields down so that you can hit their hull with the next salvo of weapons fire? 1) Enemy crew will be running around the enemy ship attempting to fix any damage you manage to inflict; even if you take out an enemy’s shield room entirely it won’t be that long before they get it back up on its feet. 2) While you are trying to take the enemy ship to pieces they’ll be trying to do the same to you, using any or all of the methods described above. So you have to fire on the enemy ship while sending your own crew members scrambling through the corridors of your own vessel to patch up hull breaches, put out fires and repair busted systems. Thankfully you can pause the game to issue orders if you need a bit of time to think so it never gets overwhelming, but it’s still a pleasingly frenetic bit of risk management: do you tackle that fire in the engine room first, or do you fix the weapons so that you can shoot back? If you have lots of crew members then you can do both at once, but I was usually struggling along with just three or four and so never had enough people to man the weapons and fly the ship and fix the hull. Things get even more complex when you get boarded as this usually necessitates dropping everything to repel boarders; otherwise they’ll run around your ship taking out vital systems like your O2 supply. Emergency solutions to problems come from an unusual source in this game: automated door controls. There’s a reason doors merit their own special subsystem; being able to open and close doors at will means that if you absolutely can’t spare crewmembers to deal with a potentially devastating fire (fires spread, so they can easily take out multiple systems) you can vent the affected compartments into space, effectively squelching the fire at the cost of dumping some of your O2 supply. This replenishes slowly but it’s not a decision to be taken lightly when one hit to your oxygen systems could lead to the remainder slowly bleeding away into the void. Trying to space intruders is less effective as they can cut through locked doors faster than the ambient O2 levels drop when exposed to vacuum, although it’s still worth trying as a desperate last resort. This constant pressure and the wealth of solutions available to you can often lead to some comic mishaps, such as the time I accidentally turned off the power to the oxygen pumps during a particularly frantic battle and half my crew suffocated before I figured out what was going on, or the time I oh-so-cleverly tried to flush some intruders into space only for them to trash the door controls before they snuffed it, meaning I couldn’t actually shut the airlocks again to repair everything. 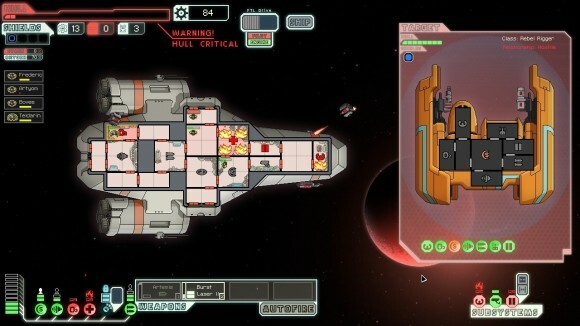 (Most accidental game overs in FTL involve the oxygen room, come to think of it.) 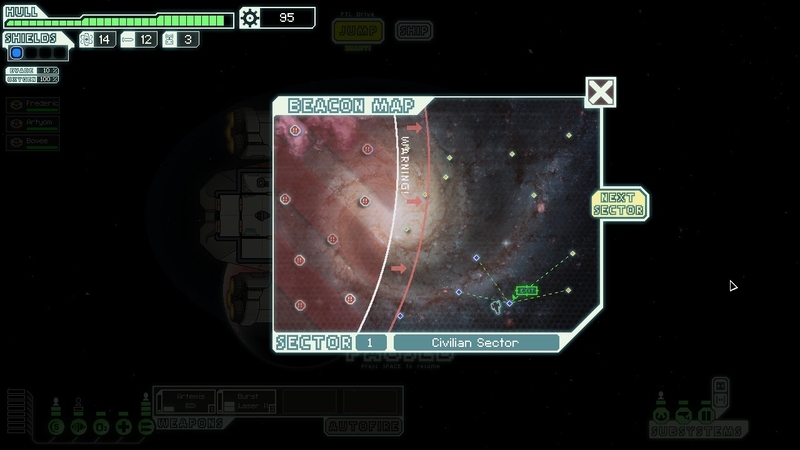 Even if you win a battle you’ll likely come out of it with some hull damage that can only be patched up at randomly-positioned merchant systems, and this is where the unpleasant side of FTL starts to rear its ugly head: the random number generator FTL relies on for so much of its variety will eventually end up screwing you over sooner or later. This is the one thing I don’t like about FTL – it’s far too willing to throw you into a no-win situation that seems drastically unfair. Some would say that’s the mark of a good roguelike. Perhaps it is. However, I take the view that roguelikes shouldn’t actively kill the player, they should let the player kill themselves through overconfidence as in the examples above. Here, with the random way the game is set up and the random items available at shops, it’s entirely possible to run into an enemy you have no way of hurting. Case in point: I just ragequit my latest game after encountering an automated drone. It had four shields and a high evasion value, meaning I couldn’t bring its shields down quickly enough to do any damage because both my ion blaster and my three-shot hull laser kept missing despite having a Master weapons officer at the controls. I had a crack team of Mantis assault troops I could have teleported on board to smash the shield room, except because it was an AI ship all of its compartments were open to vacuum and they would have suffocated. And I couldn’t jump away to avoid it because it was sat on top of the sector exit node. I basically lost that playthrough because I hadn’t had the good fortune to encounter a merchant that sold missile weapons, which would have gone right through the shield to destroy the shield controls. Then there’s the ship unlocks. I’ve unlocked a massive one extra ship type in eight hours of playing FTL. I know there’s more – lots more – in the game because I see people talking about them, but I have no idea how to unlock them because the game doesn’t seem to want to tell me how. This means I’m mostly stuck with the basic Kestrel ship layout and equipment, which all but ensures I have to play the game the same way every time. I honestly don’t know why the developers thought it would be a good idea to hide all of the ship variants behind an unlock system instead of giving the player a starting choice of three or four that they could choose from depending on how they want to approach a certain playthrough; as it is FTL’s miserliness with ship types has hugely compromised its replay value for me, as I’m sick and tired of nursing the Kestrel to the final sector only to be destroyed by the end boss because I hadn’t managed to pick up enough crew members or good enough weapons to kill it. So I think I’ve come to the end of my time with FTL. Everyone else seems to be having a whale of a time with it and I have the sneaking suspicion that I’ve just been incredibly unlucky in not unlocking any extra ship variants to prolong the game’s lifespan. That FTL can do that to me in the first place isn’t something I can perceive as anything other than a fundamental structural flaw, though. I think the game relies on randomly generated scenarios a little too much for its own good, and while it’s far from being the most offensive abuser of procedural generation it does diminish it in my eyes somewhat. Otherwise, this is exactly the sort of game that Kickstarter is meant for: a great new idea that wouldn’t have gotten any traction in the existing game development system that is nevertheless tremendous fun to play and which is on the whole rather well realised in terms of the combat that makes up 90% of the game. I’m sure I’ll go back to it at some point. Just not, you know, now. It is cripplingly hard. It’s a nice background game, though, much like Dungeons of Dredmor. Individual games are low-investment. Yeah I do like that a game takes ninety minutes at most to smash your way through to the final system. You die a lot, but it’s surprisingly easy to swallow up until the end boss. Like any good Roguelike, I alternately love it and hate it. Absolutely agree about the ship unlocks, though – I had a peek at what to be looking out for and I’ve yet to encounter any of the events which lead to new ships. I’ve actually found Easy to be just about the right balance of difficulty and risk vs reward with the bog standard Kestrel, up until the huge difficulty spike with the final boss. I’ve come mighty close to beating it a couple of times now, but always fallen apart at the crunch – which is a touch disconcerting considering I could be breezing through most encounters due to my careful choice of upgrades. 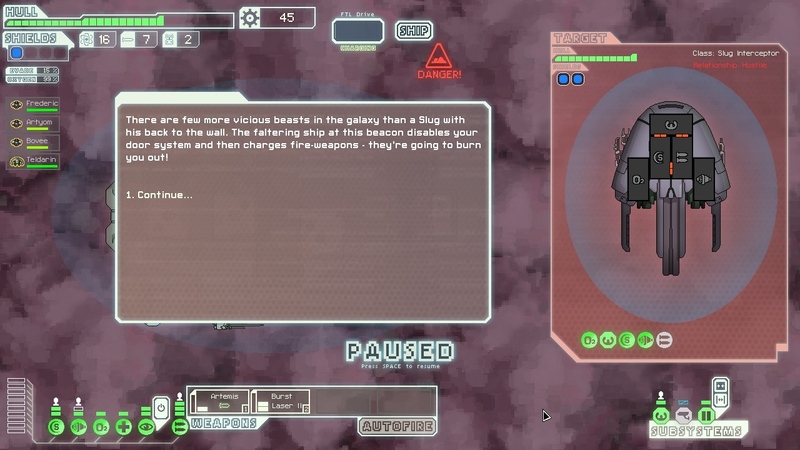 Watching your ship go up in flames feels like a real kick to the teeth, as with most high-level Roguelike deaths, but especially if it’s due to extra special abilities (GOD DAMNED DRONE SWARM) that you can’t do anything about. But yeah I think it’s almost great, could just do with a few small tweaks IMO. Yeah, it’s definitely on my list of things to try. I love the idea and do need to find the time to give it some attention! Question: Does the rebel fleet advance at a fixed rate or a relative one? For example, if I jump out of a sector with the fleet just about to overtake me, will they arrive at the next sector quicker than they normally would, or at the same time regardless? I’m fairly sure it’s fixed. You get X number of jumps before they turn up, and then they advance at a fixed rate. This is why it’s better to milk a sector of everything you can until the last possible moment rather than jumping out early for a time advantage that doesn’t exist. I found it an ok game and played for about an hour..then a few hours later..for some unknown reason..I felt like playing again. So I did. and then again…and again..and now again. It grew on me really quick. Really having a good time with it. It;s probably best played as an occasional game, like minesweeper; the sessions are short enough that you can finish one in a single sitting, so it’s the sort of thing you have permanently installed on your computer to toy with every now and again. I don’t think it stands up that well to the kind of obsessive play I subject games to as that really accentuates its flaws (too random, too repetitive). I’m surprised you didn’t unlock any of the ships other than the Enterprise one you get for killing the boss. If you do some of the quests then you’ll end up unlocking quite a few of them. In the version I played I got a new ship just by advancing to sector 5. That one was armed with an ion weapon and drone which gave me an advantage next playthrough and I got further, and so on. As fantastic as this game is though, it’s really only the beginning. The possibilities for improvement and extra features is enormous. Online multiplayer. Each jumped to system being a fully explorable solar system with its own randomly generated planets and events, more RPG like elements for the characters… onwards and upwards, faster than light.